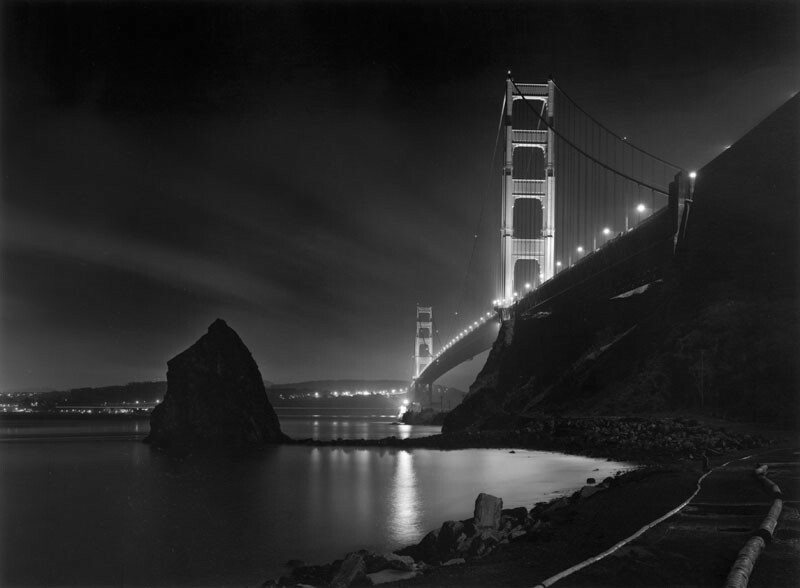 Having grown up in Sausalito, the first town north of the Golden Gate Bridge, the last thing I ever thought about photographing was the bridge. Then I got a dream assignment from the Bank of America...photograph the bridge like I would if making a fine art image for myself. No other restrictions. It was a challenge, but it gave me the opportunity to see something so familiar with new eyes. There was nothing in this scene both large enough and bright enough to get a useable light reading, so I guessed! I don't usually bracket exposures, but in this case I had to. Working with my 8x10 camera, TMax 400 film, a 360mm lens and f:16, I made exposures of 6, 9, 12 and 15 minutes. This is the six-minute exposure. On close inspection, there are some tiny streaks in the sky...airplanes. There is also a long straight white line, not far above the water, that stops abruptly between Needle Rock and the left edge of the image. That's the bow light of a ship coming in to port. The line stops because that's when I closed the shutter.